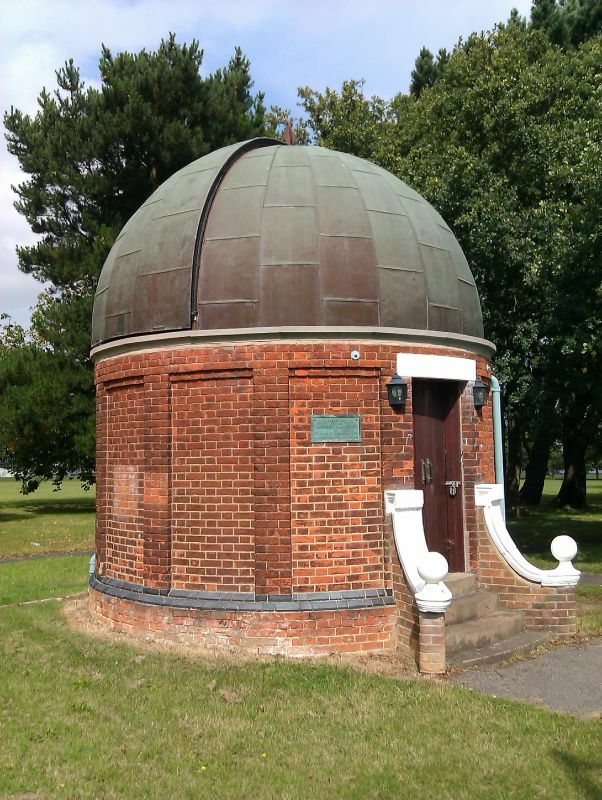 The Alexander Observatory, Aldershot is dated to 1906 and contains an astronomical refracting telescope. MATERIALS: red brick with white stone dressings and with a copper surfaced dome. PLAN: The building is circular, 7m in diameter, with 11 brick panels and an entrance with a stone lintel. EXTERIOR: The four step entrance is flanked by curving walls with a stone coping ending with a ball finial on each side. The dome rotation and dome opening, which is a triangular sector, are both operated by a pulley and rope. A commemorative plaque on the side of the building bears the legend ‘Presented to the Aldershot Army Corps by Patrick Y Alexander Esq 1906’. INTERIOR: The telescope, an astronomical refracting telescope (Object Lens: 8-inch F:12 focal ratio) mounted on a gunmetal German-type equatorial mount, dates from 1891 and was constructed by Howard Grubb of Dublin. All the usual fittings associated with this type of professional instrument were provided. The clock drive (allowing the telescope to remain in sync with the rotation of the earth), which will run for about two hours without rewinding, has a facility to vary the drive rate. Declination and Right Ascension (the two co-ordinates on a celestial sphere equivalent to geographic latitude and longitude) slow motions are fitted. The declination and RA circles are large and the declination circle is provided with a reading telescope for one vernier. The eyepiece fitting of the telescope, with magnification up to 500X, is rotatable with a Position Angle circle and vernier allowing, with a micrometer eyepiece, accurate positional measurements. The Observatory, Queens Avenue, Aldershot was constructed in 1906 and officially opened on 22 December of that year. It was built to house an 8-inch aperture cell, duplex lens refractor and equatorial mount which was manufactured by Howard Grubb of Dublin in 1891 and donated by Patrick Alexander. Patrick Young Alexander (1867-1943) was a professional balloonist of note and the holder of several record ascents. The telescope is thought to have been originally erected in the grounds of his residence at ‘The Mount’, Batheaston, Bath, where Alexander had a workshop which housed a small team of people designing and manufacturing experimental sonde (weather) balloons and meteorological instruments. The telescope was probably used to track pilot balloons which were released before the main balloons. It is not known if Alexander used the telescope for astronomical purposes at this time, but he became a member of the Royal Astronomical Society in 1921. In 1902 Alexander offered the telescope to the city of Bath together with an observatory, but this offer was refused. Alexander moved to Mychett, Surrey in 1903-1905 and lived at the same address at one time or another as Samuel Cody (Cowdery), an early pioneer of manned flight, both working in the Army Balloon section at Farnborough. In 1905 Alexander offered the telescope to the War Office, the offer was accepted and the observatory was erected on its present site. Patrick Alexander was very well respected within the aeronautical world and counted such people as Wilbur and Orville Wright and Louis Bleriot as close friends. At one time it was muted that the telescope should be moved to a research establishment, but this never happened and it has remained where it was first installed. The dome was originally made of rubberoid material which eventually perished and so was rebuilt using copper cladding in 1987. The most important event in the history of the observatory was the discovery in August 1933 by the amateur astronomer John Pettley of the white spot on Saturn, but this was not confirmed by the Royal Observatory at Greenwich due to cloud cover there, and was claimed the following day by the actor Will Hay who was also an amateur astronomer. The observatory has been used by local amateur astronomers and societies over the years, but light pollution and other problems preventing clear views have caused a decline in its use. In 1979 the observatory was closed, because of corrosion within the dome, and not reopened until 1987, after major refurbishment by the Army had taken place. The main optical cell has been removed several times for cleaning and inspection in its lifetime. In April 2000 the telescope objective lens was re-ground by the Sinden Optical Company, through the auspices of the Farnham Astronomical Society. * Historical interest: For its association with Patrick Young Alexander, a professional balloonist holding several record ascents and a known figure in the early aeronautical world, who was a friend of Wilbur and Orville Wright and Louis Bleriot.